Like many other people with a genetic disease, Dave Jacob did not learn that his childhood heart defect was related to an underlying genetic mutation until it was uncovered he also had a life-threatening aortic aneurysm. After gathering as much information as possible and visiting many doctors, Jacob discovered that both he and his younger sister shared the same congenital heart defect and now both have aortic aneurysms. At this point, Jacob turned to the closest genetic expert he knew, his oldest daughter, Dawn (Jacob) Laney. As part of a unique Christmas present, Laney collected blood from everyone in the family, organized testing, sent Jacob to top doctors in familial aortic aneurysms, and began an eight-year medical odyssey to find an answer for the family. Laney was particularly suited for this search, as she is a genetic counselor, instructor, and Director of the Genetic Clinical Trial Center at Emory University. During his diagnostic quest, Jacob found himself “Googling” a wide variety of possible diagnoses from Ehlers Danlos to Marfan syndrome. Overall he found a lot of misinformation. By the time he had his diagnosis of the rare genetic condition Cutis Laxa, he had decided to be proactive and find a global solution to increase accurate information on the Internet about genetic diseases. He wanted to empower people like himself on diagnostic odysseys to locate the best answers and resources. Being an IT-focused businessman, former EDS and Data General vice-president and a current IBM Premier Business Partner, Jacob and his company co-founder, Len Barker, were able to access the power of IBM’s supercomputer Watson to develop an exciting, interactive new tool – ThinkGenetic. 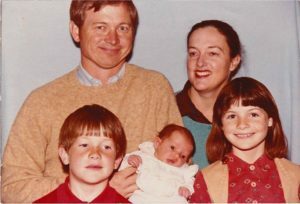 “With the unique talents of my IBM software development practice, IBM Watson’s ability to associate facts, the knowledge of one hundred genetic counselors, and my personal medical journey, I knew we could help others find answers and next steps,” said Dave Jacob, co-founder and CEO of ThinkGenetic. Beginning with two hundred genetic diseases that are tested for in newborns, found on large genetic carrier tests, or are treatable conditions, ThinkGenetic.com is designed to be a cutting-edge way to empower patients. ThinkGenetic provides answers for those who want to know about possible genetic causes for their medical issues, obtain real-life answers to their questions about the impact of their genetic diagnosis, and find out real life next steps. While not a medical diagnosis tool, Jacob does hope to speed time to diagnosis and reduce chances of diagnostic error as well as answer many questions about living with the disease and appropriate next steps. “We think of ThinkGenetic as a GPS for people and families living with a genetic diagnosis or seeking a cause for their unsolved medical mystery,” continues Jacob. ThinkGenetic has been developed to date through educational grants, research projects, and angel investors. Jacob is now looking for champions and supporters in his business, personal and genetic community to help get the word out and expand the genetic disease coverage to all genetic diseases. The ThinkGenetic.com beta, released on June 30, 2016, will undergo three months of intensive testing and modifications before going live in the fall with more features and greater disease coverage. The project will continue the ongoing effort to add diseases as funding and sponsors allow. In the meantime, Jacob hopes to encourage his local community to support his efforts by contributing to the Kickstarter campaign at bit.ly/ThinkGenetic. This is an amazing and innovative idea – it can really help so many! Just now reading and learning about this. I am Harvey C. Jacob, son of Harvey A. Jacob who was the half brother of David Jacob’s father Morgan F. Jacob who we called “Uncle Happy”. I am know a lot of the Jacob family history having grown up in Washington, D.C. and was close to the whole family and David’s and my Grandfather Harvey Damion Jacob. I am now 85. Its been a year now since the beta of ThinkGenetic launched. We now have agreements with six major pharmaceutical companies with four more working on agreements. In addition we have been supported by 120 genetic counselors around the world and by numerous advocacy groups. The ThinkGenetic content has been used by patients in over 100 countries to help shorten their time to diagnosis by providing answers to their genetic disease questions from discovery through diagnosis, testing, treatment and living with a condition. I am so grateful to the dedicated ThinkGenetic staff, our angel investors, kickstarter contributors and so many others.